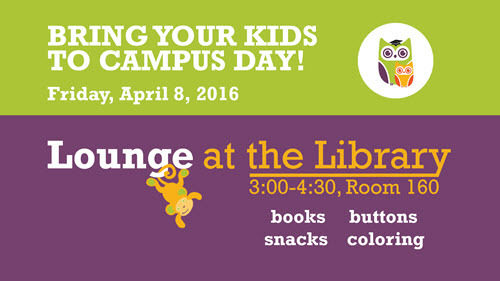 Home → Events, News → Lounge at the Library with Your Kids! Lounge at the Library with Your Kids! Friday, April 8 is Bring Your Kids to Campus Day, sponsored by the PSU Resource Center for Students with Children. The Library will be joining in the fun! Enjoy some healthy snacks and read some great books from the Library’s collection of award-winning children’s literature. Make a button! Color with us!